What are the pros of geothermal heating and cooling? 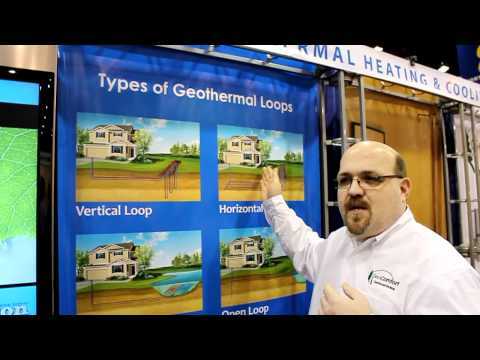 In this video, David Sayler, a product manager for GeoComfort, explains the pros of geothermal heat pumps when it comes to heating and cooling a home. David will explain the various options for geothermal loops as well as showing a geothermal heat pump unit that would be installed in a home. Traditional heat pumps have a condensor on the outside of the home as well as an air handling system within the home. The Geothermal heat pump is a self contained unit that resides entirely within the home. This video was taken at the GeoComfort booth at the AHR Expo in Las Vegas. AHR stands for Air Conditioning, Heating and Refrigeration.